Every year I make the same amazing turkey recipe given to me by my bestie. I wanted to share it with you and also repost the link to the cobbler I am making, a fan favorite in my family. This turkey has amazing flavor with the combination of fresh herbs, fruit and also the Herbs de Provence. Make sure you use authentic Herbs de Provence, with lavender, as the imitation version does not have the lavender and that makes the dish. To make the turkey: Position the rack in the lowest third of the oven and preheat to 400 degrees F.
Cover the turkey breast with foil. Roast for 20 minutes. Pour 3 cups of broth into the pan and stir to scrape up any brown bits on the bottom of the pan. Add the remaining sprigs of fresh herbs to the pan. Roast the turkey for 40 minutes. Reduce the oven temperature to 350 degrees F. Remove the foil from the turkey; pour 1 more cup of broth into the pan. Continue roasting the turkey until a meat thermometer inserted into the thickest part of the thigh registers 165 degrees F to 175 degrees F or until the juices run clear when the thickest part of the thigh is pierced with a skewer, basting occasionally with pan juices, about 1 hour and 30 minutes longer. Transfer the turkey to a platter and tent with foil. Let stand 30 minutes while preparing the gravy. To make the gravy: Strain the turkey pan juices from the roasting pan through a sieve and into a 4-cup glass measuring cup; discard the solids. Spoon off the fat from atop the pan juices. Add enough chicken broth, about 1 to 2 cups, to the pan juices to measure 4 cups total. Melt the remaining butter in a heavy large saucepan over medium-high heat. Add the flour and whisk for 1 minute. Gradually whisk in the broth. Simmer until the gravy thickens slightly, whisking often, about 10 minutes. Season with salt and pepper. Serve the turkey with the gravy. I have always been a fan of cutlet themed dinners. From Marsala to Parm to Milanese, a cutlet dinner can be satisfying and simple. I usually make my Aunt’s go to Lemon Chicken recipe loaded with heavenly mushrooms. Recently I decided to change it up after seeing the Barefoot Contessa make her version. Ina is a talented chef and I have tried many of her recipes before. Yes she is a bit fancy pants but that doesn’t deter me from trying her decadent takes on dishes. Lemoore is nothing like the Hamptons, believe me, but making her recipes takes me outside of my little world. This lemon chicken was amazingly juicy and delicious. 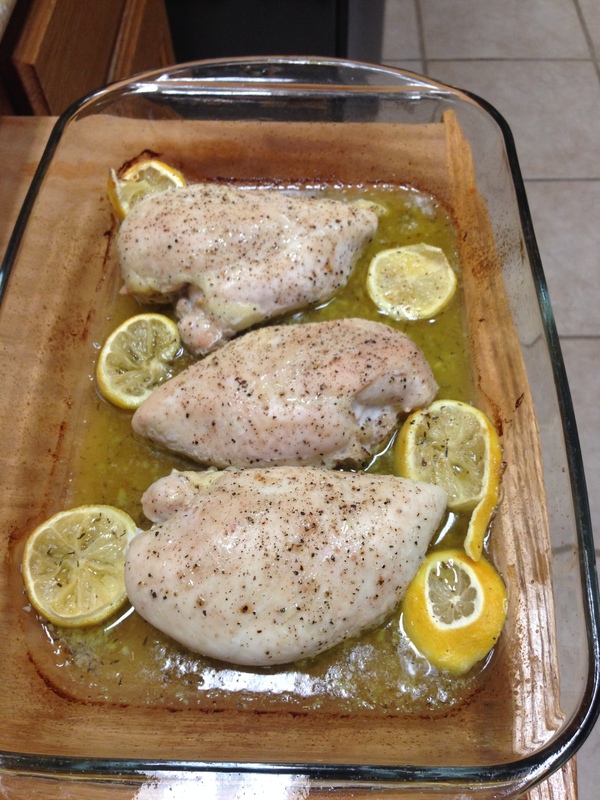 The combination of olive oil and wine with just the right herbs and fresh lemon made chicken sing with flavor. So if you want to make a simple dish that makes you feel fancy for a moment, check out this version of Lemon Chicken and I promise you won’t be disappointed. You are currently browsing the What Tara's Cookin' blog archives for November, 2014.